En español | Prices have soared for some popular brand-name drugs widely used by older men and women — medications whose patents are close to expiring. Why? Manufacturers tend to hike the prices of those drugs in the year or so before they lose their exclusive marketing rights, according to two new reports. Will Your Drug Be Going Off-Patent Soon? The brand-name medications listed below are among those whose patents are expected to expire sometime this year. (The key word is "expected," as any number of factors can delay the introduction of new generic drugs.) If past trends continue, these common brands could see price increases in the double digits before lower-cost generic equivalents are available. For example, retail prices for brand-name drugs that would face generic competition in 2010 rose by more than 10 percent annually in 2008 and 2009. But the silver lining for consumers is that an unprecedented number of top brand-name prescription drugs are due to lose patent protection in the next couple of years — opening the way for generic versions that cost far less. Blockbuster drugs expected to go off patent this year include Lipitor (used for high cholesterol), Xalatan (glaucoma) and Zyprexa (schizophrenia). In 2012 patents are scheduled to expire for Clarinex (allergies), Lexapro (depression), Avandia (diabetes), Plavix (blood clots), Seroquel (psychosis) and several drugs used to combat cholesterol and high blood pressure. An analysis by AARP Rx Price Watch Report, released today, finds a consistent pattern of steep price hikes among brand drugs a year or so before they face generic competition. One reason for the increase, the report suggests, is "the unprecedented number of drugs that will be going off patent and facing generic price competition in the next few years, which may have led some manufacturers to increase their prices in an effort to maintain corporate revenue and profits." AARP has been tracking the retail prices of widely used drugs since 2004. Its new report finds that cumulatively "the retail price of brand-name drugs that have faced generic competition in 2010 rose by 51 percent … between the end of 2004 and the end of 2009," which equals an average hike of $762 for one year of therapy between those two dates. "Much of this increase took place in the two years" before lower-cost generic versions appeared on the market, the report adds. The first generics for the prostate drug Flomax, for example, came on the market last year. 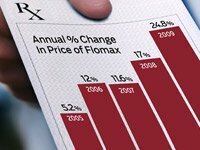 In its last two years of patent protection, Flomax's price increased by 17 percent in 2008 and by 24.8 percent in 2009, AARP researchers found. Buttressing these findings is a new analysis of prices for the 15 best-selling drugs by Thomson Reuters MarketScan, which measured the average cost of a daily dose as shown in payments made by insurance companies. It found much higher price hikes in 2010 than in earlier years. Payments for Lipitor, for example, rose 11.4 percent last year, compared with 5 percent in each of the previous five years. Payments for Seroquel jumped the highest, by 16.5 percent. "The analysis indicates that drug makers are scrambling to make as much money as possible from blockbuster drugs before their patents expire, while taking advantage of the fact that last year's healthcare reform bill did not cap drug prices," Reuters reports. Typically, people with insurance do not pay the full retail price for drugs. However, "the fact that [insurance plans] are paying more for drugs is likely to push up the premiums they charge at a time when healthcare costs are already rising much faster than inflation," Reuters says. Individual plans in the Medicare Part D prescription drug program negotiate with the manufacturers for discounted prices. But these can still be pushed up by a rise in basic prices in ways that affect Part D enrollees — especially those who pay a percentage of the cost for their drugs instead of a flat dollar copayment. Also, price hikes result in people falling into the Part D "doughnut hole" more quickly. That's the gap in coverage that starts after the total cost of their drugs, what they pay and what their plan pays, reaches a certain dollar limit in any year. This year, under the new health care law, as the first step toward closing the gap completely, enrollees will pay 50 percent of the cost of brand-name drugs in the doughnut hole, instead of the full cost they had to pay in previous years. The drug manufacturers themselves are contributing the other half. Still, AARP's report says, "the value of [these] discounts … while substantial, could be eroded over the years if substantially escalating drug prices are not addressed." Brand-name drugs typically receive between 12 and 20 years of patent protection. When this expires, lower-cost generic versions that have been approved by the Food and Drug Administration as having the same medical effectiveness are allowed on the market. Their use has saved the U.S. health care system $824 billion over the past decade, and nearly $140 billion in 2009 alone, according to IMS Health, a company that tracks drug industry trends. Using generics instead of brand names also saves consumers money, because insurers charge significantly lower copays for them. Medicare Part D enrollees often find that switching to generics helps them avoid the doughnut hole. Brand-name manufacturers usually do not lower their prices when they start facing generic competition, but instead continue to raise them, the Price Watch analysis found. "Thus, consumers that choose to continue taking a brand name product are not likely to experience any price relief at patent expiration," the report says. Use AARP's Drug Savings Tool to see whether a similar but less expensive medication exists. If so, talk to your doctor about possibly changing your prescription. If you are covered by Medicare Part D, visit AARP's Doughnut Hole Calculator for suggestions on how to cut your prescription costs. If you have prescription drug coverage that offers a discounted mail-order pharmacy plan, consider using it. If a lower-cost generic equivalent of your brand-name medication becomes available for use, ask your doctor about switching. Depending on your situation, you might qualify for financial assistance.